Showing 40 of 217 results that match your query. Product - King Size Fitted Mattress Cover Vinyl Waterproof Bug Allergy Protector Bed New ! King Size Fitted Mattress Cover Vinyl Waterproof Bug Allergy Protector Bed New ! Product - Queen Size Zippered Mattress Cover Vinyl Protector Allergy Dust Bug Waterproof ! 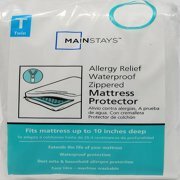 Queen Size Zippered Mattress Cover Vinyl Protector Allergy Dust Bug Waterproof ! Product - Queen Size Zippered Mattress Cover Protector Dust Bug Allergy Waterproof New ! Queen Size Zippered Mattress Cover Protector Dust Bug Allergy Waterproof New ! Product - King Size Vinyl Zippered Mattress Cover Protector Dust Bug Allergy Waterproof ! King Size Vinyl Zippered Mattress Cover Protector Dust Bug Allergy Waterproof !